Corrugated fiberboard has two main components - linerboard and medium. Linerboard is the flat facing that adheres to the medium. 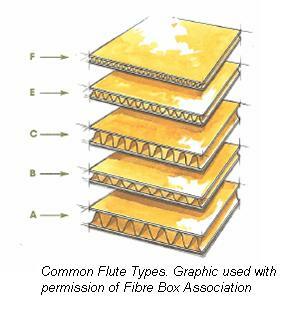 The fluted medium is glued between the linerboard facings and provides protection and insulation. The medium is typically bonded to the liners with a starch based adhesive. A flat piece of fiberboard that has been cut, slotted and scored is called a box blank. For many box types, two box blanks are brought together using tape, staples or glue to form a box. Where they are adhered is called the manufacturer's joint.